0.35 per cent of the population within the age limits for the scheme are currently taking part. Updated 2.32pm with improved data*. 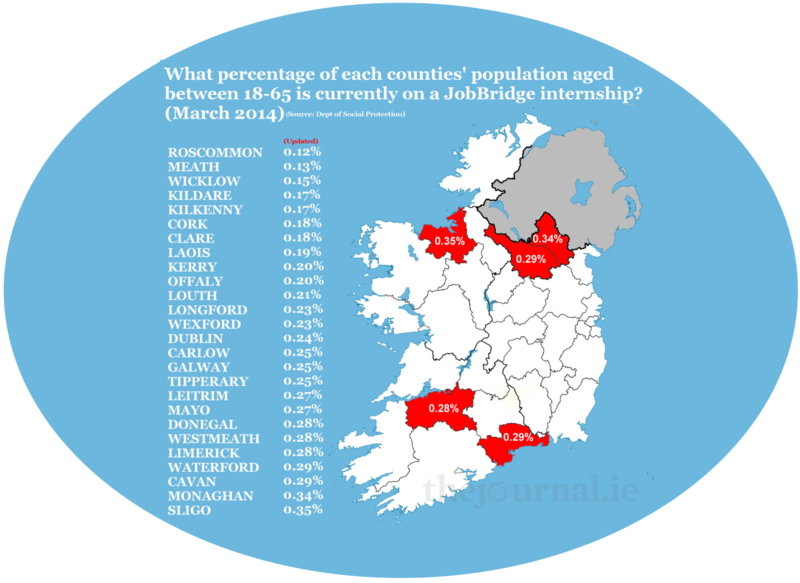 SLIGO CURRENTLY HAS the highest rate of people taking part in the controversial JobBridge internship scheme. 144 people, or 0.35 per cent of the population aged between 18 to 65, are currently taking part. Dublin has the highest actual number of people taking part, with 2033 participants (0.24 per cent of the population). There are currently 6,586 jobseekers on JobBridge schemes across the country. There has been a total of 26,650 placements since the scheme began in 2011 – enough for 0.91 per cent of the eligible population. A jobseeker could have taken part in more than one placement. “Independent research indicates that over 60 per cent of interns progress into paid employment within five months of completing their internship,” Minister Joan Burton said. Many rural counties have been adversely badly affected by unemployment. Figures from the CSO show that 124,219 people on the Live Register in Border, Midland, and Western region in February of this year, and 273,850 Southern and Eastern region. Population figures are based the population of each county aged 18-65 from Census 2011. *Article previously stated that Carlow had the highest rate of people currently on JobBridge interships. Updated data shows that it is ranked 12th, with 86 people on internships making up 0.25 per cent of the population. Click here to see raw data here (.csv format). Email “Sligo has the highest rate of people on JobBridge right now”. Feedback on “Sligo has the highest rate of people on JobBridge right now”.